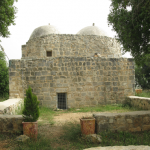 The Shrine of Sheikh Qatrawani, recently and beautifully restored by the Palestinian Ministry of Antiquities, was built in the 16th century during the Mamluk period on top of a Byzantine monastery. It consists of two semi-spherical domes and may have been part of a chain of watch-towers that overlooked the surrounding flat-lands. Accounts of its origin differ. One connects to an Islamic beginning centered on a Sufi holy man from Gaza’s village of Qatra, Sheikh Ahmed al-Qatrawani, who was directed by angels to settle on the hill-top of Dar Hamouda. Some local historians believe he was fed and protected by the villagers who later buried him near the shrine. Others believe that the Sheikh came to the site after his death when his body descended to the hill-top. zantine monastery. Hamdan Taha, the noted Palestinian scholar of Sufi shrines, points out the similarity of the Muslim belief that a dead body descends to its place of burial to the Christian belief that Catherine’s dead body descended to the top of Mount Sinai. Taha also notes the aural similarity between “Qatrawani” and “Catherine”. The shrine today is visited by both Muslims who come to offer vows and Christians who come to be near the remains of the Christian monastery.